People with plantar fasciitis or other forms of foot pains will always love sneakers that provide better comfort. 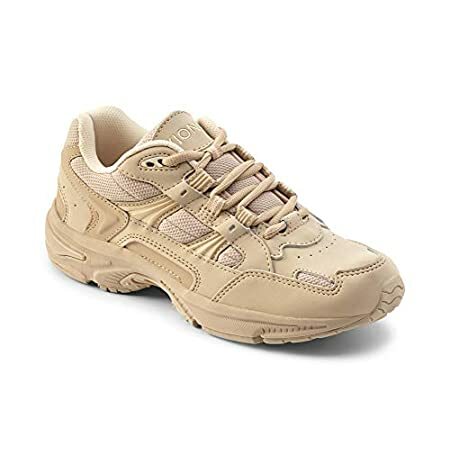 Vionic Women’s walker is designed with top quality materials with insoles that keep the foot warm and contoured with needed support for an effortless walk. The shoe is actually designed for those who walk a long distance on a regular basis. There are several other benefits of this sneaker for women, which will be explained in the following paragraphs. The material is made of leather. This makes it long lasting and very durable. Another thing about the material is their soft feel on the foot. It is tough but comfortable enough for those with plantar fasciitis. The workmanship and high-quality leather material make it the right choice for heavy trainers and those who have a higher level of pronation. The inserts in the insole make it even more comfortable for long distance walk. The leather material is also water resistant. However, the shoe may not hold off when submerged in water. Vionic Women’s walker may not be the lightest when it comes to weight. But the comfort is quite on point. The quality material coupled with the sure-fit design makes it contour to the foot. It eliminates any form of pain you may have suffered wearing a less comfortable shoe. It features active motion technology (AMS), which provides orthotic effects. The shoe has a breathable upper design as well as the cushioned outsole. This makes it ideal for play, work, and everyday training. Moreover, it has fabric-covered footbed for better transition when walking on the hilly areas. This Vionic women shoe is stylish enough, with its threaded lace. And its podiatrist design technology makes it flexible and more accommodating on the feet. The shoe also comes in different colors. So you have the option to choose whatever color that suits your style. How a walking shoe grips the foot is another important consideration to make when selecting one. Luckily, this shoe is neither too tight nor too loose on the foot. The lacing system on the shoe gives it the right fit. But, it does not have a good grip at the bottom of the shoe. Those walking on the slippery environment may not have too much help from the shoe. But if you are more concerned about how it holds your foot, then this is a great choice. It is not difficult to wear or pull because of the slightly elastic design. The shoe comes with a durable rubber outsole that stands the test of time. And, no, this is not the type of rubber material that shrinks easily. Its top quality outsole can withstand heavy use for a good number of years. The insole is very soft and accommodating. In fact, they are quite comfortable and help eliminate any trace of pains. People with plantar fasciitis will find the insole of the shoe very comfortable. The soft and ​smooth insole​ keeps your feet relaxed even after walking for a long distance. This technology is what makes the Vionic brand stand out among other brands in the market. This system helps the feet stay relaxed. It provides comfort, stability, and optimal support for women on the go. This technology features a cushioned midsole and a breathable upper. The cushioned midsole enhances your glide and does not seem to drag you back as some other shoes do. That is why it’s perfect for those who are frequently on the road or taking walking exercise. Is this a good shoe for plantar fasciitis? Yes, it supports and snugly fits the foot to avoid plantar fasciitis pain. Making sure that your foot will be cuddled carefully yet in a firmer way, you can still feel the awesome comfort provided by the soft inner layering. Is this shoe cozy and comfy right from the Day 1? No, it may take a bit of time to offer cozy and comfy feel as having a bit tougher toe for keeping the foot stable inside and safer from the outside. Is this shoe easy to wear? Yes, the shoe offers a lace-up closure which is easy to open and close when needed and help in adjusting the shoe to fit snugly and keep the foot safe from getting twisted. Is this shoe long lasting and durable? Regarding the durability of the shoe, there is no doubt but it depends on how it is worn and used. In case if they are used by too heavy or tall people with the tough routine of running and exercising, the shoe may show early wear and tear. With regular usage, it keeps intact and stays in shape for a longer period of time. Does this help with foot pain? Just as mentioned above, this one is for supporting plantar fasciitis. It can help alleviate foot pain and support the particular foot posture so that there is a lesser chance to develop muscular pain. The Vionic Women’s Walker is one of a kind if you consider its numerous features. The comfort and cushioning effect is top class in the industry. It may have one or two shortfalls, but the shoe is well made. When chosen correctly and used in a way for which it is meant for, the shoe can be a lasting benefit for those struggling with foot pain and especially Plantar fasciitis. As far as comfort goes, the shoe is one of the best. It’s also ideal for those suffering from foot pains. Based on the experiences and research, experts recommend Vionic Women’s Walker for women looking for comfort and durability and has been shared by the many users as their first choice to alleviate foot pain.